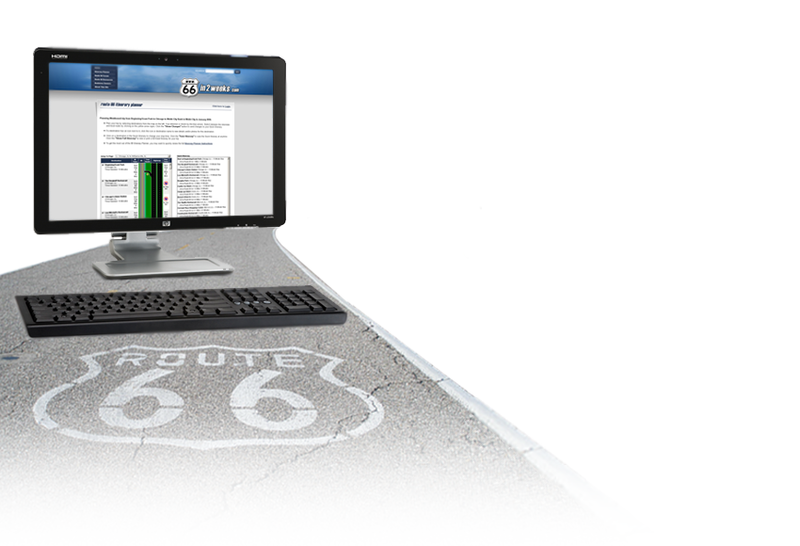 Welcome to the world's first and FREE Route 66 Interactive Travel Planner! Plan your Route 66 trip by selecting from thousands of popular destination along the route. Use our estimates, or create your own, for how long you will spend at each destination. Choose if you will take Route 66 as much as possible, or if you will bypass sections on the interstate to save time. Figure out exactly how much you can do in one day, making sure that you don't miss out or have to rush through destinations you really want to see. Help estimate the costs for your trip by knowing how much mileage you will cover, knowing destination costs, and estimating costs of hotels and meals. Create and save an itinerary online that you can edit at any time, or access wirelessly while on your trip. And best of all, its FUN and its FREE! For the traveller on a limited time schedule, you need to plan your trip - identify where you plan to start and end, and the places you want to stop along the way. If you want to stop at a certain popular restaurant for lunch, you need to know that you will be there during lunch hours. If you want to see a movie at one of the many drive-ins along the way, you need to know you'll be there in the evening. All this planning and timing takes a lot of research and a lot of time. And each time you discover a new place to stop, you mess up everything you've already done! And although the internet has a wealth of information about popular destinations, no site actually helps you plan your itinerary - Until Now! Welcome to the web's First and Only interactive Route 66 Itinerary Planner. 66in2weeks.com offers a free, interactive, travel planning tool. It includes many of the popular destinations along the route, and new ones are added every day as recommended by users and local businesses. We do not advertise, and therefore offer unbiased content. Best of all, by creating a free profile, you can create your intinerary and come back at any time and make updates to your trip as your plans change. And when your finished, print out your itinerary and take it along with you on your trip. Start using the 66 Itinerary Planner, and begin your adventure of history and excitement. Also, be sure to check out our Route 66 Forum to create or read postings on a variety of topics!